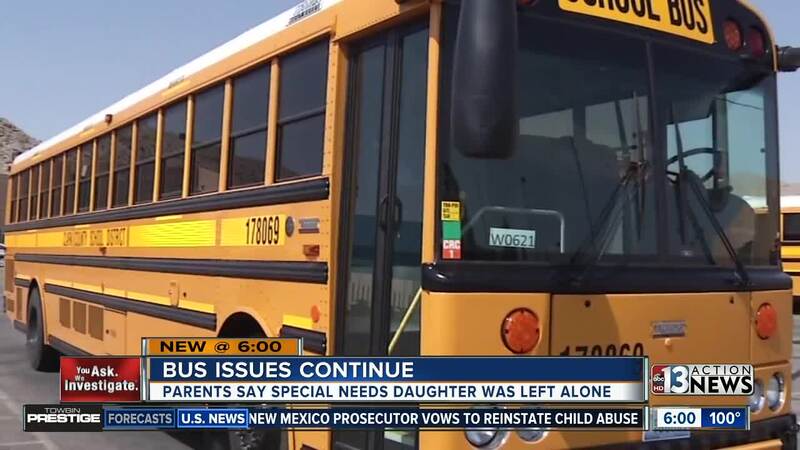 A special needs girl and her family are demanding changes after her delayed school bus meant she was left to fend for herself for an hour. "Dear bus driver, would you be on time please?" asked Mallory Reynolds as she read from letter she wrote. Mallory's father, Russ Reynolds, says his daughter wrote the letter after the latest problem with her Clark County School District bus to school. "We are talking about a child who has a heart condition, seizure disorder, she has autism, and she's home alone," Reynolds said. On Monday, the school district's transportation office called Reynolds nd informed him there had been a medical emergency on board Mallory's bus prior to her stop. A representative told Russ the replacement bus would be sent and would arrive about 15 minutes late. "I would like to see a lot more consistency, at least with special education, to get their bus system squared away," said Reynolds. Reynolds said the 15-minute wait turned in 60 minutes, which meant Mallory was left alone much longer than he would have liked. A Clark County School District spokesperson confirms a passenger on the bus suffered a medical emergency and Mallory's replacement bus was late. Contact 13 first reported Mallory's bus trouble in April 2018, when the Reynolds family documented a routine problem with the bus.